In neuroimaging, fMRI, EEG and MEG, it is quite common to circumvent the requirement to correct for multiple comparisons by reducing the multidimensional data to a single value per subject per condition by selecting a region/electrodes/time window of interest. Previously, I have shown that the results of statistical tests are biased if this is based on where any effect is maximal (http://www.ncbi.nlm.nih.gov/pubmed/23639379). However, it is common practise to select these region/electrodes/time window of interest from an orthogonal contrast to the one of interest in a factorial design. In other words, if we have a 2X2 design with factors A and B we might select our region/electrodes/time window of interest where the main effect has the highest statistical difference and then test whether the interaction is significant, averaging across this region/electrodes/time window of interest. However, is this biased? The answer is maybe. What follows is covered in "Circular analysis in systems neuroscience: the dangers of double dipping" by Kriegeskorte et al. (2009) http://www.ncbi.nlm.nih.gov/pubmed/19396166. This simulation assumed that cell A1 had a different variance to cells A2, B1 and B2. If I now rerun the simulation but now assume that all cells have unequal variances by dividing the variance of A1 by 1, A2 by 2, B1 by 3 and B2 by 4 then the proportion of false positives rises above 50%. That's actually quite reassuring, no? For once a simulation that confirms my intuitions!! In the context of ERPs it makes sense to pick your time window in this fashion. If you're looking for how one factor mediates another (ie an interaction) then you want to pick based on where that factor being mediated actually exists. 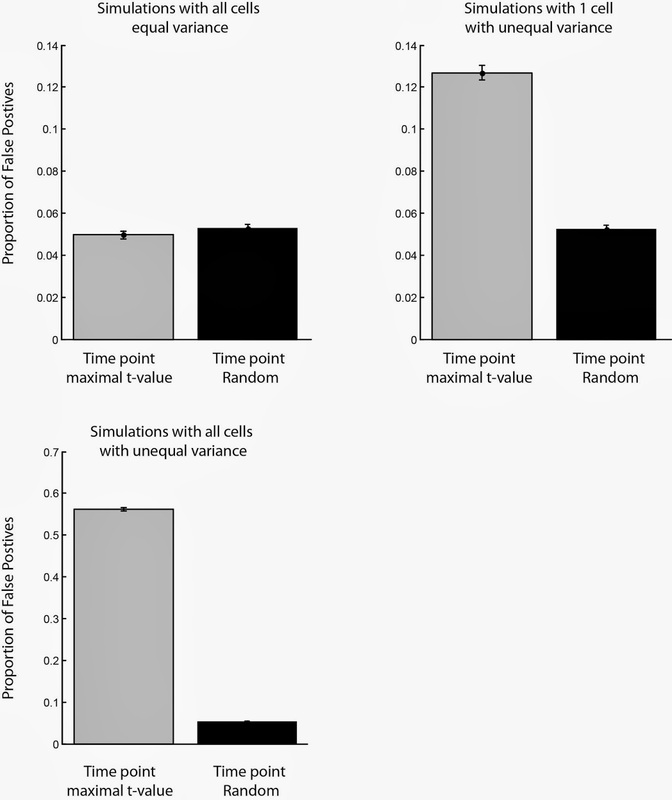 But as your simulations indicate, this only makes sense (ie its only unbiased) if the different cells are contributing equally to the choice of time window. If you have one cell with much greater variance then that's going to have a disproportionate influence on where the peak is. So then you're picking based on that cell rather than the orthogonal contrast. In fact, I guess you could argue that the two factors are now no longer orthogonal (statistically at least). I'm trying to think of a real context where this would be a concern. I thought of the MMN but you'd need to have reason to suspect that the deviant response was much bigger in one contrast than in another. Anyway, any chance of posting a version of this on figshare so it's citable?